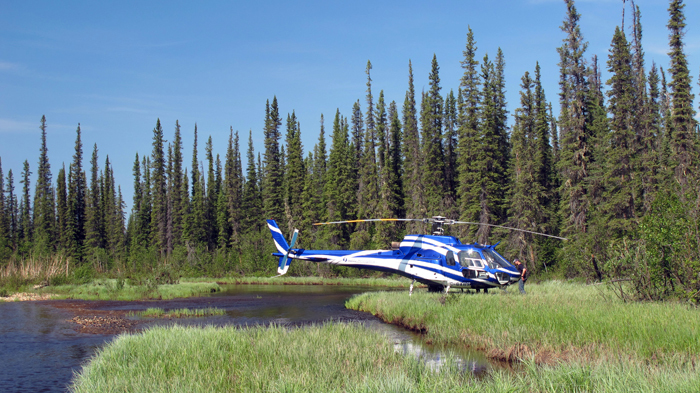 Team Wells wrapped up a memorable trip to the Mackenzie Valley last week. In addition to completing all the required sampling protocols, we got out for a fine day of riverboat collecting on the Mackenzie River (courtesy of Richard Popko, NWT Department of Resources, Wildlife & Economic Development) and a helicopter trip into the foothills of the Mackenzie Mountains (courtesy of Glen Guthrie, Sahtu Renewable Resources Board). This gave us access to sites that were otherwise completely inaccessible, providing many fine collections. Helicopter perched on the bank of a black fly infested river in the Mackenzie MountainsRuben Cordero experiments with a novel technique to dislodge aquatic insects from the substrate. Not to be outdone by “Team Arthropod’s” entry in Yellowknife’s “Midnight Sun Triathlon”, Team Wells participated in the Third Annual Bearathon in Norman Wells, finishing the 5K race in the medals! The fact that anyone crossing the finish line received a medal shouldn’t diminish our accomplishment! Our time in Norman Wells passed all too quickly, and it was with mixed emotions that we moved on to our next site. Many thanks to all of our good friends in Norman Wells, including Alasdair Veitch, Richard Popko, and Glen Guthrie. We couldn’t have accomplished our objectives without your support! Anna, Katie and Ruben departed for a night in Inuvik, before hooking up with new Team Leader Terry Wheeler in Dawson City. They are now stationed at the Tombstone Mountain campground in Yukon’s Ogilvie Mountains. “Old” Team Leader Doug returned to Toronto, where he’s now gearing up to rejoin Team Wells on the last leg of the trip… to the wilds of Aulavik National Park on northern Banks Island. Standby for the next Team Wells blog post, originating from the heart of Klondike Country. Beringia it on! 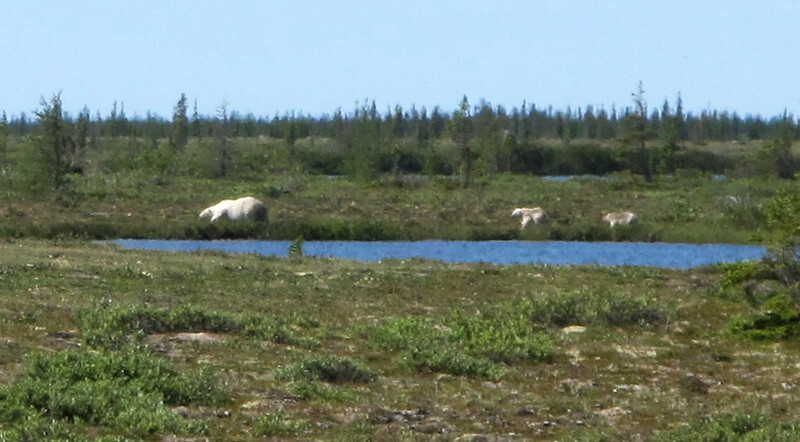 We’ve received a final update on Team Moose’s activities in Churchill, Manitoba. While some of us are still dearly hoping to see some of the larger, four-legged arctic fauna, it would appear that the gang in Churchill is incredibly lucky…perhaps too lucky? Thank goodness for bear monitors! Team Moose successfully completed its final day of collecting in Churchill. 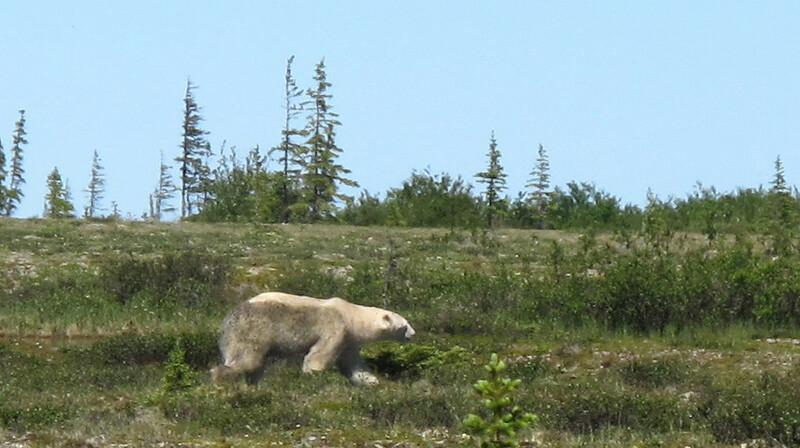 Our timing was good as there now seems to be an inordinate number of bears in the area. Today we saw a total of five bears, including a sow and two cubs. None of them were close enough to seriously disrupt our activities; but we noted that the sow and cubs were headed in the general direction of one of our traplines. Sure enough, we later discovered that the cubs had great fun chewing on our yellow pan traps! Our only close-range visitor was a single large caribou that skirted a trapline as it headed toward Ramsay Lake. We weren’t sure whether it was trying to avoid the biting flies, or whether it was trying to escape something larger. Fortunately, we were once again accompanied by Carley, our ever vigilant bear monitor. Tomorrow is repacking day. And on Thursday we board a late morning flight to Winnipeg. 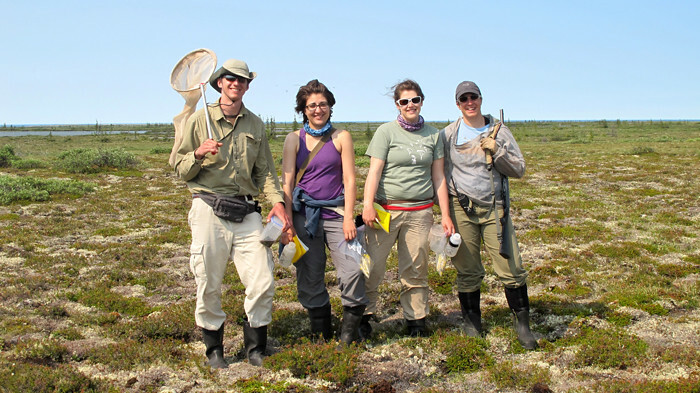 Anna, Jana and Patrick will carry on to Iqaluit for a further two weeks of fieldwork, where they will be joined by new Team Leader Chris Buddle. Meanwhile, Doug will try to even-out his ‘farmer tan’ in Toronto, before departing for warmer climes in Corcovado National Park, Costa Rica. 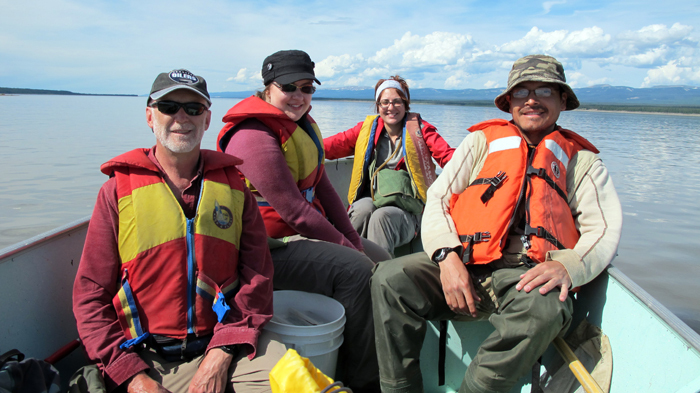 Stay tuned for more exciting news from Team Moose as they enter into the final leg of their 2010 field season! Team Moose has a close enounter…of the Polar kind! We’re now into the home stretch at Churchill! Today was ‘Aquatics Day’, and tomorrow we decommission our traplines. 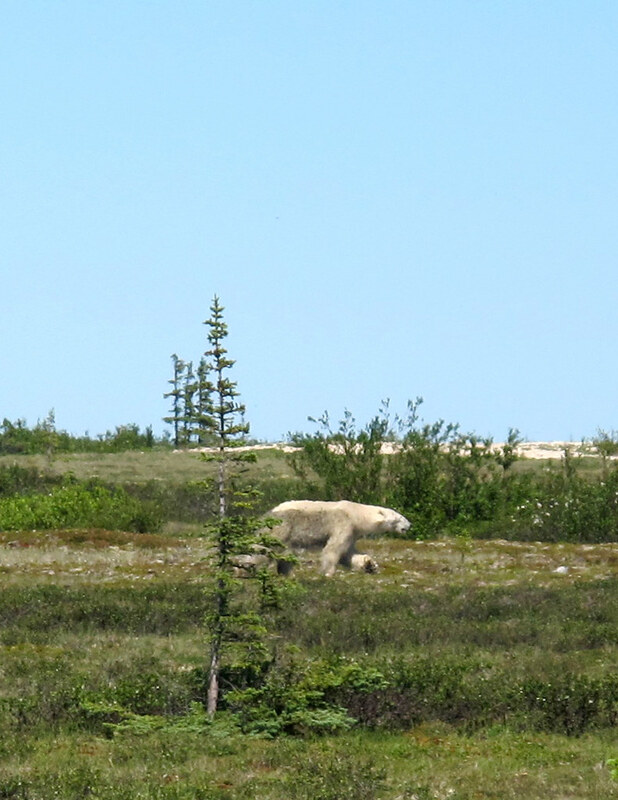 This afternoon’s collecting activities were interrupted when a polar bear suddenly appeared from a thicket of willows — less than 200m from where we were picking one of our aquatics samples. As our attention was focussed intently on the sorting trays, it was fortunate that our Bear Monitor was keeping a watchful eye! We quickly gathered our gear and walked briskly towards the vehicle, which was parked some 50 meters from where we were collecting. The bear was evidently only curious about us, and retreated back into the willows, only to reappear again as we drove away. 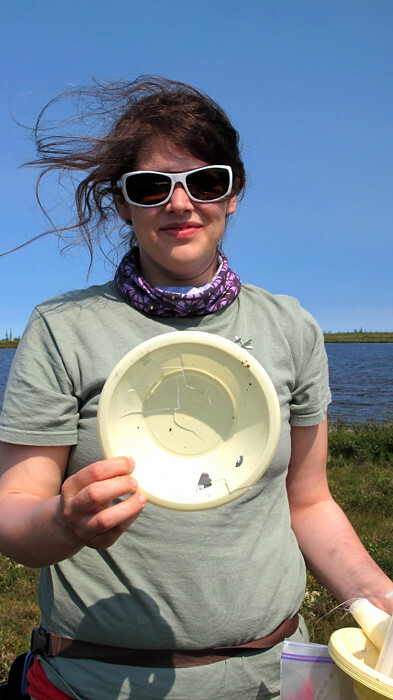 We finished sorting the sample in an open tundra site, well away from our uninvited guest. Want updates? Subscribe to the NBP blog!